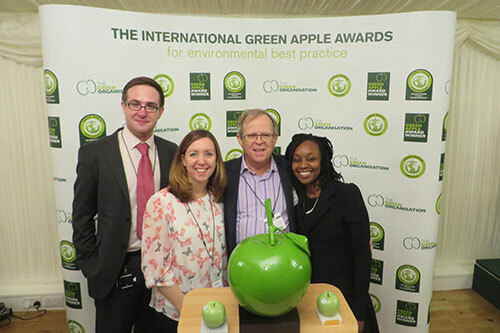 The annual Green Apple awards campaign, organised by The Green Organisation, rewards businesses and institutions for their work helping the environment. City University London’s initiatives to help the environment and reduce waste were noticed by waste company Bywaters, who then nominated the University for the award. City works closely with Bywaters to maximise recycling rates that will in turn reduce carbon emissions and reduce the impact on the environment. Bywaters and City worked together to create a video titled ‘The Secret Life of Rubbish’ explaining what happens to your rubbish if recycled correctly. City has also run a number of successful projects to reduce the impact the University has on the environment as part of schemes like Green Dragons, Environmental Champions, Sustainability Leaders and Green Impact. What is unique about City’s Sustainability team is the way they are centred around staff and student engagement towards sustainability. As a whole, City maximises ways to engage and educate the community through their online platforms, including their environment pages, which include thorough information about recycling and waste. 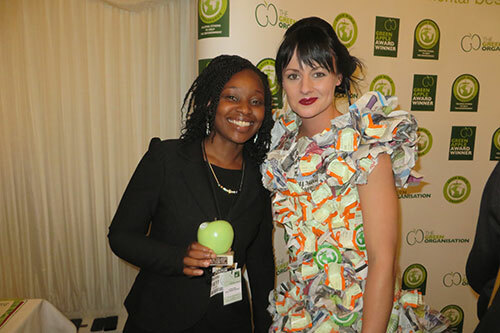 Afua Yeboa-Henaku, Sustainability Engagement Coordinator at City attended the Green Apples ceremony at the House of Commons where she was presented the award by avant-garde fashion designer Aleah Leigh Woods. Aleah is pictured (right) with Afua at the ceremony wearing one of her recycled creations made from used train tickets and newspaper roses. Afua added: "It was great to hear about all the amazing things that other organisations across the world are doing to lessen their impact on the environment. The fact that they were held in the Houses of Parliament was a bonus."